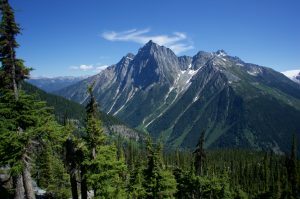 Mount MacDonald’s north face rises sheer and intimidating for nearly 5000 feet from the road just north of Rogers Pass. 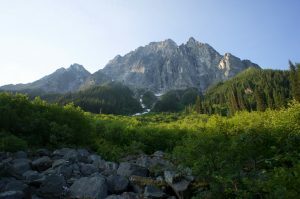 Looking at it and reading about it, I hoped it would be something like Johannesburg Mountain: essentially no approach, and a big, relentless, varied face, climbed via its 5.4 central rib. Unfortunately this is not what I found. I know I was off-route at the top, but deliberately so, since by then I was just trying to end the misery. Lower down, I think I was on the correct rib (there are several), but instead of the promised “solid, blocky quartzite with incut holds,” I found fifth class moss. I made it up and down, but it was a tough 6 miles. After taking advantage of Rogers Pass’s excellent trails for a couple of days, it was time to experience something more like the primeval Selkirks. I parked near the second avalanche shed, bashed down to the creek, and found a couple bits of flagging on a jumbled mess of fresher and older logs, the “official” crossing of Connaught Creek. From there, a closely-spaced line of flags marked a basically nonexistent trail through open forest, headed up and left to a slide path that was a mixture of grass and alders. The flags seemed to give out a short distance from the central stream and dirt-chute leading from the north face. 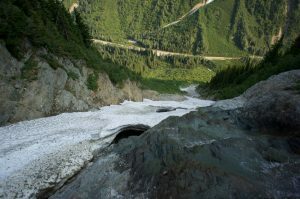 There was still a fair amount of old slide snow in the chute, covered with enough debris that I could climb it with no crampons and my axe for security. However, I was somewhat wary of the snow, as there was running water below, and I saw a 50-foot section spontaneously collapse with a loud “whump.” Near the split, where I was supposed to follow the left branch, the terrain was a mixture of questionable snow, stream, polished rock, krummholtz, and steep dirt. Rather than fight snow and water in the gully, I climbed along its right-hand side, which started out reasonable and gradually turned less pleasant as it merged with the face. Traversing under the toe of the central rib, I found myself farther above the gully than I probably should have been. There is a strange patch of rotten, light-colored rock here, which decomposes to deposit evil, outward-sloping dirt on the ledges below. I climbed left and up, trying to escape the choss either into the gully or above, but found myself doing a lot of unpleasant, slow, defensive climbing. It was probably no worse than fourth or low fifth class, but it was mentally exhausting. I finally passed the choss, and angled back up and right to the buttress, finding the fourth class moss mentioned by the guidebook. Unfortunately things did not seem to improve much on the buttress, where I found wide cracks, awkwardly-angled ledges, and more moss. I tried climbing right on the crest, and just to either side, but did not find an enjoyable line. Maybe I was just mentally worn down from the choss below, or maybe I was off-route, but at this point I just wanted it to end. Improvising, I traversed left at a ledge, climbing a broad bowl scoured mostly free of moss, which was mostly fourth class with a bit of fifth here and there for spice. 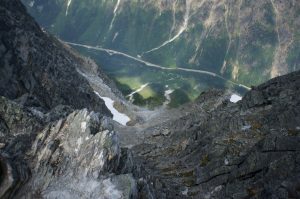 Near the top of the face, a broad, rubbly ledge crosses below a final headwall. The route description says to head slightly right from the rib to surmount the headwall on blocky 5.4 ground, but I thought I saw a break to the left, so I just used that. I stemmed into a moat, made a couple steep moves, then followed easier ground to finally emerge on the east ridge. Sunlight, easy ground, and impressive views of the Avalanche Glacier and Sir Donald to the south. The summit register was in a PVC tube, so it was a wet mess, but it was still legible enough to make out a few names, including Colin Haley back in 2014. I knew the descent would be non-trivial, so I did not hang out for long before making my way down the southwest ridge looking for the Herdman Couloir. 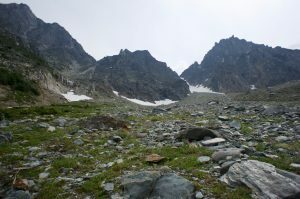 The ridge required a fair amount of route-finding to get around ribs and steps, with a final, extended bit of 4th class to reach a talus saddle where it flattens. I found a few slings where others had apparently given up and rapped. 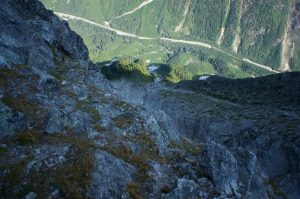 As I later realized, I should have continued past a small bump to reach a broad couloir before the larger, unnamed peak where the ridge turns northwest, but there were a bunch of slings at the top of a narrow, steep dirt-chute. This ended up requiring more sketchy, careful climbing, sometimes kicking steps in snow, sometimes stemming in the moat with a hand and foot on the rock, and an axe and foot on the snow. I passed another rap station made of two fix and equalized nuts, then finally emerged in a broad, steep heather bowl with a clear view down to the highway. Looking back, it seemed like even rapping the chute I had descended was a mistake, as pulling the rope would unleash a rain of debris. After hours of mistakes and unpleasantness, things finally went my way for the rest of the descent. I guessed correctly that the route followed the left-hand side of the stream to avoid brush, finding a bit of a boot-pack in places where the stream-bed was too steep. I lost the route again near the valley bottom, but the bushwhack was tame by North Cascades standards, with only a bit of devil’s club. With a bit of fishing, I found another flagged mess of trees to cross Connaught Creek, then walked the highway back to my car. 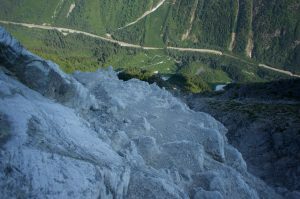 There are plenty of fun things to climb in the Rogers Pass area, so I see no reason to subject yourself to this. Aaaargh! you gotta stop indulging in that franchised stuff. Agreed. I am thinking of tagging Liberty Bell when I’m in the Cascades, but reconsidering my Taco Bell plans. Sweaty palms just looking at it…but the last section to the summit looks nice! Heh. That was just about the only fun part of the day. 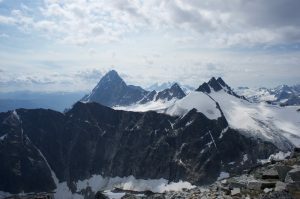 The three “5.4” routes I did in Rogers Pass (Macdonald, NW ridge Sir Donald, Asulkan Ridge) perfectly illustrate how much variation there is among climbs with the same YDS grade. Great write up, I love these left turn at Albuquerque adventures. After all, who wants to read about a climb where everything goes right…. As much as I want to indulge my readers, I think I’ll try to limit the number of these adventures I have.